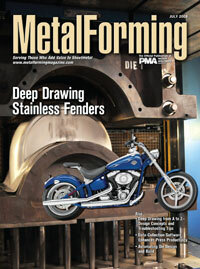 Die-design and simulation software; a switch in tool steel and coating; new hydraulic-press technology; and tight-tolerance laser trimming combine to provide Harley-Davidson with a breakthrough fender design for its new Rocker motorcycles. These deep-draw experts explain the deep-draw process, complete with tips and tricks to ensure proper, problem-free forming. Investment in software to collect productivity data allows this Wisconsin stamper to find and fix press-utilization problems. More efficient material packaging; processing of heavier, larger coils; faster setups; and ordering coil widths to tighter tolerances represent some of the techniques available to minimize the cost of raw materials to metalformers. RCM Tool takes die design and build to another dimension with a CAD/CAM system that streamlines die design, optimizes CNC machining and employs robotic machine loading to automate die-detail manufacturing. BesTech Tool Corp. uses technology to stay competitive in the brutal world of tool design and build. The complete switchover from 2D to 3D design is one example, enabling the company to cut lead time and deliver tooling that works right from the start. Submitted on behalf of the American Industrial Hygiene Association (AIHA). For more information on occupational health and safety topics or to access a list of industrial hygiene consultants who specialize in safety issues, visit aiha.org.